CHARLOTTE, N.C. – Oct. 31, 2013 – RK Motors Charlotte, one of the nation’s premier restorers, re-sellers and builders of classic, muscle and high-performance cars, spearheaded a project to restore and customize a classic Ford Bronco in honor of fallen hero, US Navy SEAL Chief Adam Brown. The truck was part of a “Give Forward” campaign where the public donated $65,319,660, while RKMC and other corporate sponsors including 5-Hour Energy, RoushYates, BDS Suspension and ESAB provided parts, services and additional funds for “Project Fearless.” The 1991 Bronco was recently completed in the RK Motors Performance Center, located in Mooresville, NC, and unveiled to Chief Brown’s family. Adam Brown’s story was chronicled in the New York Times bestselling book “FEARLESS,” by Eric Blehm. Killed in action during 2010 in Afghanistan, Chief Brown died placing himself in the line of fire to protect his unit. These actions saved the lives of several of his men. The 12-year US Navy veteran was awarded the Silver Star Medal for his heroism. He is survived by his wife and two children. The 1991 Ford Bronco was the model’s 25th anniversary year. With its fuel injected V8 engine, it was considered a cutting edge American off road truck. 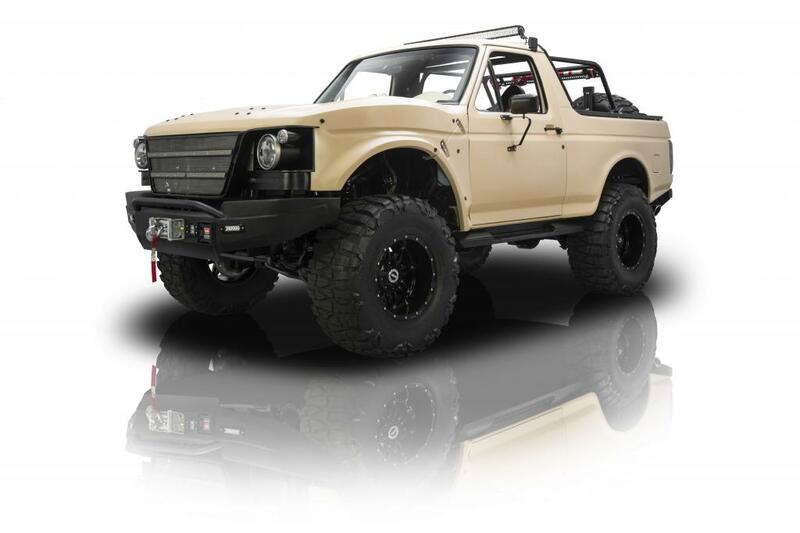 Now clad in custom bodywork, “Desert Tan” paint and upgraded throughout, the “Project Fearless” Bronco was transformed into virtually a new vehicle. “The initial goal was to simply restore the truck,” said Darell Johnston, RK Fabrication and Team Leader for the Bronco Project. “But as we got to know the Brown family, their vision to make the truck something much greater, much like Chief Brown lived his life, took the build in a new direction. So we stripped it down to the frame and methodically began building the ultimate go-anywhere, do-anything vehicle. It’s a true reflection on the man we’re honoring”. RK began its renovation with the Ford’s heart. The original V8 was replaced with a new 5.0L “Coyote” Aluminator engine that churns out over 400 HP. It is connected to a Transzilla T56 six speed with a Centerforce dual friction clutch sending power to a 241 GM transfer case with slip yoke eliminator. The rear end was replaced with a Ford 8.8 unit using Yukon 31-splines while the front axles get their power from a “Detroit Locker” sporting 4:56 gears. The suspension features a BDS lift system, Warn locking hubs and a Power Slot brake system. The team wanted the exterior of the Bronco to reflect the truck’s capabilities, so the body was prepped for a new “Desert Tan” finish. The Bronco now has a one piece fiberglass hood that flips forward to open, fiberglass wheel flares, custom bumpers, a Warn M12000 winch, “ammo storage” boxes on rails and custom Superbright LED lighting. The side trim and emblems were smoothed and deleted for a more modern appearance. The “super truck” rides on 18”x12” Fuel Off-road wheels wrapped in 38/15.50/18 Nitto Mud Grappler tires. The interior was not left untouched. It was enhanced with custom Corbeau seats, custom panels, hand fabricated dash, LED accent lighting, Classic Instruments’ aviation-style gauges, a Vintage Air climate control system, Kenwood touchscreen stereo sending tunes to the Alpine speakers, subwoofer and 5-channel amplifier, as well as various military hardware touches. The vehicle will be displayed to the public for the first time this weekend at the RKM Collector Car Auction, from Oct. 31st through Nov. 3 in the Charlotte Convention Center. It will be next shown at the Charlotte International Auto Show from Nov. 21 through Nov. 24in the convention center, also. For more images of the Bronco, please follow http://myclassicgarage.com/social/profile/operation-fearless. Those interested in RK Motors Charlotte or the vehicles available in its inventory, can visit www.RKMotorsCharlotte.com or call (704) 596-5211. RK Motors Charlotte is the nation’s premier restorer, re-seller and provider of classic, muscle and high-performance cars. It was established in 2010 when Rob Kauffman, founder of RK Collection and co-owner of Michael Waltrip Racing, and Joseph M. Carroll, founder of Best of Show Automotive, leveraged their success and experience to create RK Motors Charlotte. Based in Charlotte, N.C., the company has a showroom at 5527 Lakeview Road. The RKM Performance Center is full service collector car care facility that has complete mechanical capabilities, interior design and installation, custom fabrication and performance upgrades. The team catalogs and documents every step of the restoration process with digital images and notes. Media can reach Joshua Weatherl, TPRM, at (214) 520-3430 or at jweatherl@tprm.com.